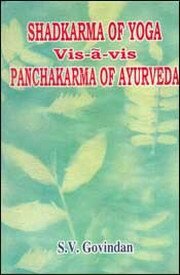 In this book the author has tried to draw attention of those who want to learn and practise Panchakarmas. At the same time those who teach, practise and learn yoga should understand what are Shadkarmas, what are the benefits by practising them and also how to practise them properly. Shri S.V. Govindan, hails from the village Manassery in Ottapalan, situated in the Palghat district of Kerala in southern India. Born on December 24, 1924. Govindanji is the youngest son in a family of five children. He spent his childhood and adolescence in Kerala where he was educated by his brothers who were school teachers at the time. Govindanji has come a long way in gathering valuable experience not only as a teacher in various Khadi Vidyalas in the country, but more so as an expert masseur with a healing and sympathetic hand. Govindanji, a devoted social worker, is a disciple of Acharya Vinoba Bhave. He has been active in the field of Sarvodaya work for many years. The usefulness, scientific reliability, and simplicity of massage as a way to serve the masses attracted him. He wanted to help those for whom the conveniences and amenities of costly medicines were out of reach. The value of this useful technique is often overlooked, even by the enlightened. When Govindanji was initiated into this field of massage by none other than Shri K. Kelappan, a national leader from Keral, he realized that it was one of his missions to promote this useful technique by study and propagation. By reading and observation he learned the theory and practice of massage. Encouraged by Vinobaji Bhave, Govindanji wrote his first publication in Hindi Maalish ka Marma. The practicality of the book attracted many who were interested in this field. Many people read it and encouraged the author to bring out this English version of it. Bibliographic Information: 80p., Colour Illustrations; Index; 23cm.